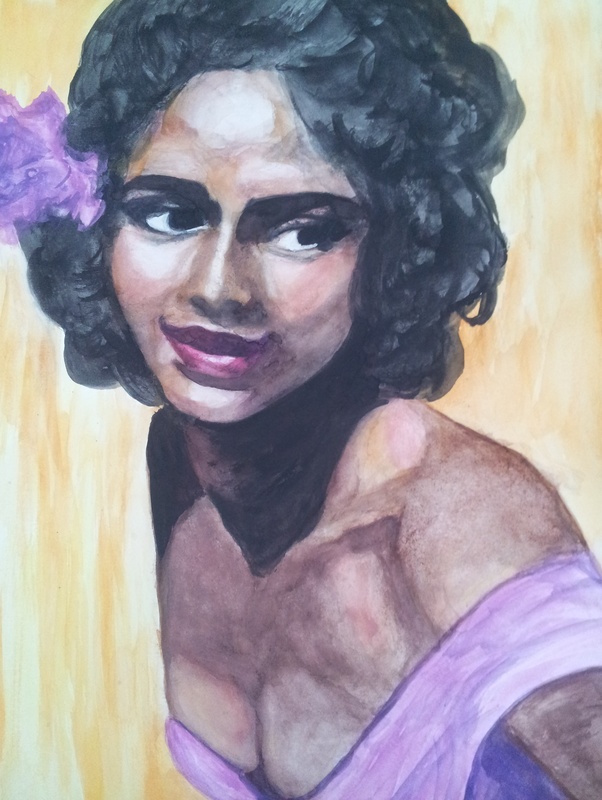 My assignment in figure painting could be anything I wanted to paint so I chose to paint my version of Dorothy Dandridge in “Carmen”. I like how it turned out. We normally use oil or acrylic but I wanted to try watercolor. Its my third time painting an assignment in water-color. I like working with it but I think I would do better if I took a water painting class. This entry was posted on May 3, 2014 by Terry Mitchell. It was filed under Completed Courses, Examples of My Art, Favorite Completed Assignments, Gallery and was tagged with art, carmen, dorothy dandridge, final, watercolor. Absolutely beautiful! Do you mind if I post this on my fanpages dedicated to Dorothy Dandridge (DandridgeLove)? I will definitely credit you. Thanks so much:) Yes please share with my credit. I appreciate it. Thank you and you’re welcome. The picture you painted this beauty after was not actually apart of the Carmen Jones publicity photos, but I see where you get the similarity because of the flower in her hair. I referred to the publicity photos from Carmen for inspiration, but went with my own design. I saw so many gorgeous photos of her I wanted to make it different. Thanks again for the interest. You’re welcome! I posted it on my IG and my followers loved it! Khaela I am considering selling this piece. Do you think you might be interested or know someone who would be?